I haven't quite gotten around to bringing the Easter and Spring decorations up yet. 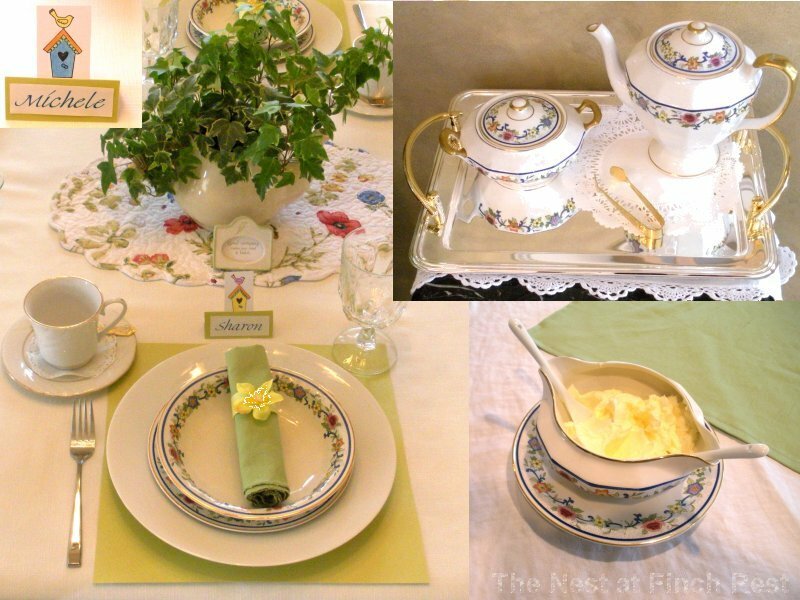 I thought I would share an old spring luncheon table for a tea party I hosted for my book club friends quite a few years ago. Before blogging. Before owning a decent camera. Before understanding lighting...or how important close up shots are....and certainly before adding much color to my world - this was a very first attempt at color. It intimidated me, I only had pretty pastel girlie girl antique linens in pinks and lavenders - what's this? Wanting to be bold with color? HOW??? So we're talking newbie tablescaper here due to that fact I was super new in the color world - and big time out of my comfort zone. But I wanted to do a fun bright and cheerful table for this group of gals - they were/are more comfortable with bright happy tables and much less comfortable with valueable delicate antique china and lace. So these shots were taken long before anything remotely close to understanding photography was part of my world (and it is yet to be discovered, trust me) so these pics are pretty lame......but this is all this sick gal is able to come up with to be part of this week's great linky parties! I just look back at these pictures and remember how much fun it was putting it together and creating something bright and colorful and new for me, and for bringing some very dear friends close together. They are wonderful ladies whom I have known for many happy years. And anytime a tablescape can bring friends together is a good thing, right? As napkin rings I simply made rings out of bright yellow paper and taped it together, then on top of the tape I hot glued a silk daffodil bloom. As placemats I used scrapbook sized card stock. I only had 6 complete place settings with the bright flowered vintage china, so the end seats were just simply plain white. It is seldom that everyone can make a party - so I was somewhat happily prepared to add two more settings to accommodate! Placecard settings were simply stamped with a bird and birdhouse motif in black ink, then colored in with the tablescape's colors - the name just printed in a bright blue from the computer. 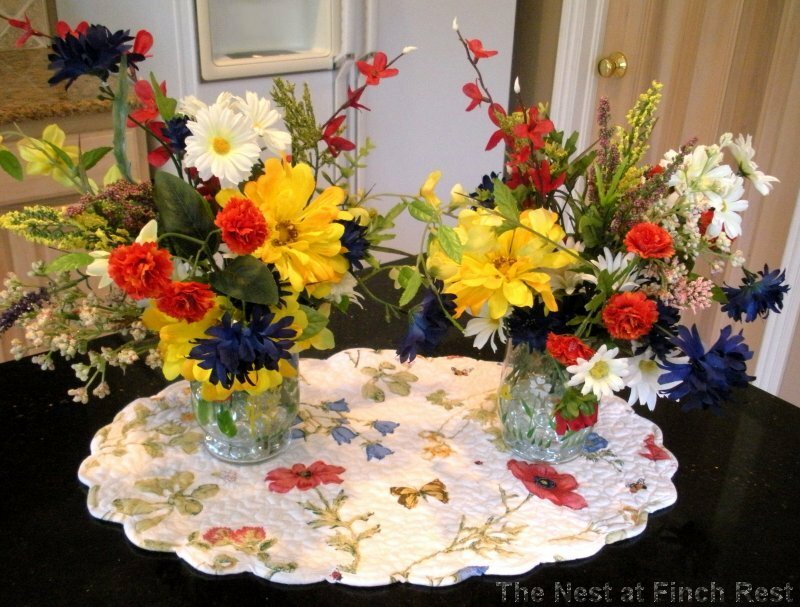 I made two of these floral arrangements for either end of the table and they were the inspiration for this color madness I was experiencing that day. I do wish I had a better photo of close-up - of the two hand painted vases they were in - they coordinated with the floral china. I found them at a favorite boutique here in my little town's historic district. I snatched them up super fast. I daresay I bought the entire set of dishes place settings for 6 (salad plates, dessert plates, soup bowls, sugar bowl and gravy server) just for the teapot alone. I realize I have teapot issues, it's true. I am not denying the fact, I am embracing it. Haha. The gravy server at the bottom of this pic is holding some homemade lemon curd I made for the occassion. It was good, but imported jars of lemon curd are equally tasty and no work whatsoever. That works for me. That was the first last and only time I ever made it, the end. 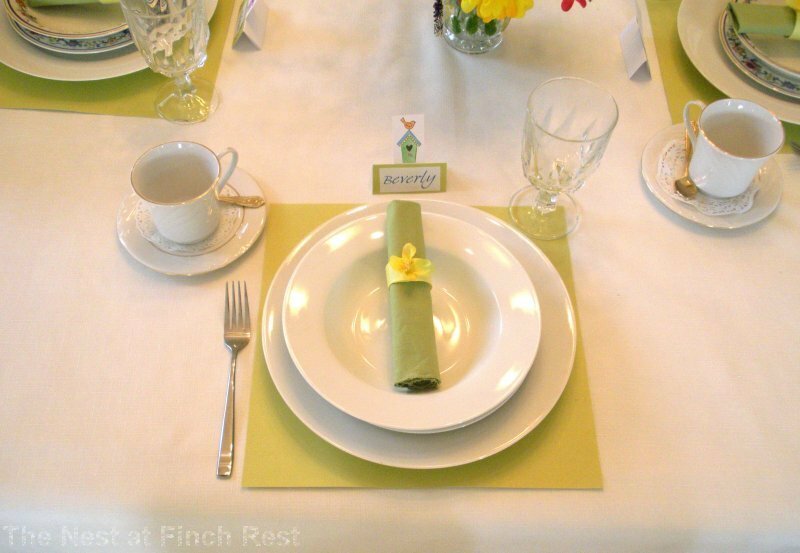 The spring green napkins are homemade. I have since upgraded to a very wonderful set of antique linens in that same color - much nicer, but this worked for back then, all I had at the time that would work! The ivy is in an old Ironstone teapot but so full you can't tell in the above pic - so here is another one after it has been clipped. I clip it down ALL the time and it takes off in other pots as gifts or whatever very easily. If you keep it clipped it stays green luscious and full, not thin and lanky. Heading over (late) for the fun at BNOTP for Tablescape Thursday! Love the color combinations. Gorgeous Spring table Michele. Well, you might have been new at tablescaping when this was done but I think it's really beautiful. I still make my own napkins sometimes, too. Wow, woman...when you bring the color, you BRING THE COLOR!!! This is great! I agree with Debbie: you may have been new to tablescaping when you first did this, but you knocked it out! I wish I had the patience to sit down and make all my own tablecloths and napkins. I would have a LOT of interesting patterns. I already have them in the ready-mades, but I'm sure I'd have some really wild, out there stuff if I could make my own! I LOVE color, so that would be right up my alley! Pretty table! Have a great weekend, and I'm glad you shared this!!! Do you know what I LOVE about this table. Its the simplicity, the understated elegance. You don't have so much 'stuff' all over it that you can't enjoy the colors. I love every single teensy weensy detail about it. And its just SO happy. But I love yellow, red and green anyway. These colors are so upbeat anyway. You are SO much better than you give yourself credit for....yes even back 'then.' I too use to make alot more of my own stuff but as I have gotten older I really prefer to buy it and let someone else do the work. I'll do the cooking and the pretty table. And buy the napkins. (smile) Aren't I pathetic. Hey luv u girlfriend! It all looks fresh and gorgeous! The tea tray is wonderful, and I love the all white settings at the end. 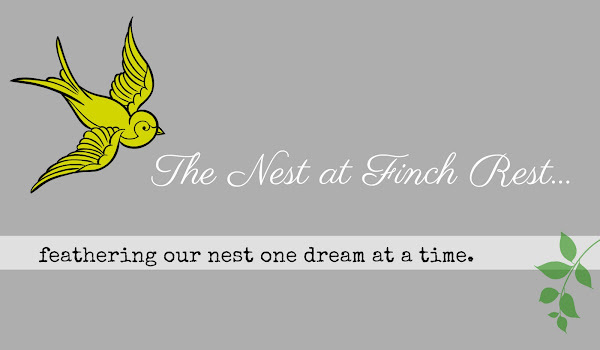 Congrats on being featured at Cozy Little House! Feel better soon! Michele, this is so fresh and pretty! Those dishes are gorgeous, and I love all the handmade elements! 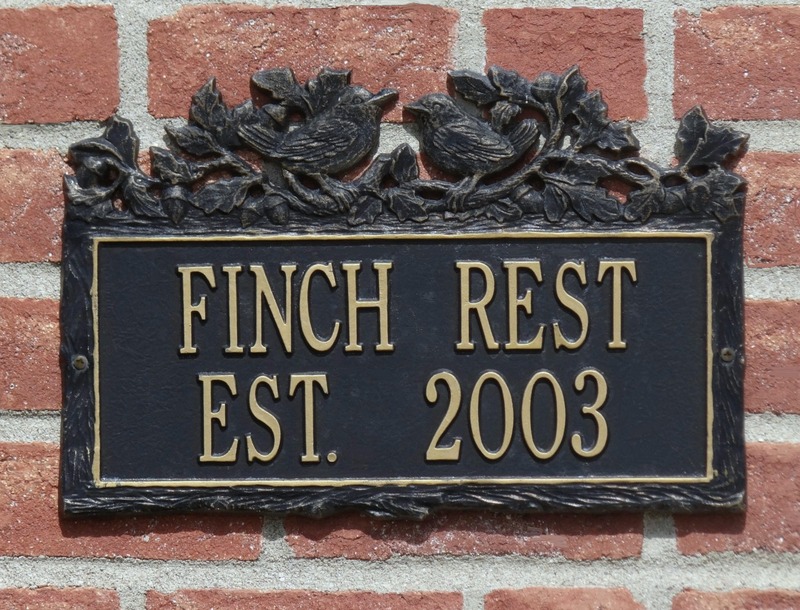 glad that I stopped by...Hope you'll visit me soon. I think this is a lovely tablescape, Michele. 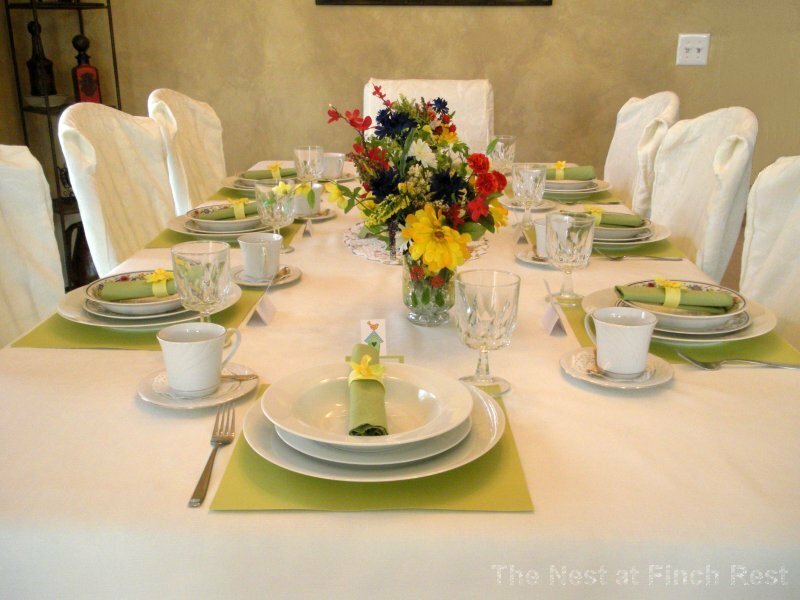 From the centerpieces to the homemade napkins, darling place cards, to the elegant tea cups. Everything is pretty! But I have to say, I think those vintage flowered dishes are exquisite! I love the combination of colors; thanks so much for sharing.